I lost the case of my cell phone some where in the sudo wilderness. 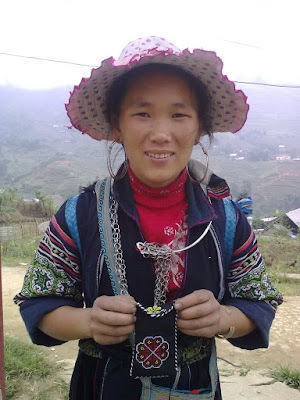 Since these Black H'Mong young ladies are handy with crafts, so I bought one as a souvenir. The case this lady to sell me was too small for my cell phone. She promised she would return the next day with proper alteration. This picture is she holding the case after alteration. VND 30,000. The price is a bit steep, but not outrageous.